Should the New Facebook Timeline for Pages Concern You? You've probably heard all the BUZZZ around the new Facebook Timeline that's debuting for brand pages. Although everyone has been talking about it, the recent changes have drawn mixed reviews. Some are totally amped to see the new look and features, while others are... ehh... let's just say they're dreading March 30, 2012. This new Facebook Timeline got me thinking about how these major changes are affecting small business' online marketing strategies overall and how they communicate and connect with their fans, customers and potential buyers. One feature that many, including myself, hate to see go is the default landing tab. This change makes it so that you can no longer send a new visitor to your welcome tab or special promotional tab. This feature was a fantastic way businesses could generate more interest, gather new leads and gain more fans. 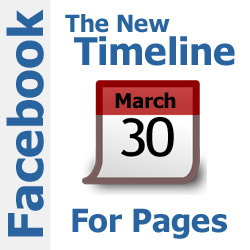 Now, for some small business owners, this change and other changes connected to the new Timeline, poses a new problem in their Facebook marketing strategy that they have to resolve. Reconsider how you'll use Facebook going forward. What, though, is the solution? I've reasoned on a solution but to lead into the answer, consider this quick analogy. If you've ever rented before, you know that before moving in to the landlord's property you have to sign a lease. And on that lease, it has rules and guidelines that you are required to follow while dwelling in the property. If you want to do some remodeling you have to request permission from the owner first. Yet, if the landlord wants to renovate or even sell the property they can do so WITHOUT your permission. Anyone using websites like Facebook, Twitter, Google, Wordpress, etc. are similar to a renter. And just like a landlord, Facebook is calling the shots because they own the property and have the legal right to do so. There are many small businesses that greatly rely on Facebook as their sole resource for an online presence. But should they solely rely on their Facebook page as their main online presence? The answer is simple... NO! You should get a piece of online property that you personally outright own. On the internet, that my friends is called... a website! A website, that you personally own, is the most important online presence you can have. Why? Because you are in control. You control the look your site, how visitors use it, and how much information you want to provide. Social media profiles do not substitute the presence of a business website. You should really view social sites as tools that help promote and increase traffic to your website. No one looks out for the best interest of your business better than you. So why would you leave your business' primary online presence in the hands of someone else? Adapt to the new changes! Instead of resisting the new Facebook Timeline for as long as you can possibly put it off, start now and adapt to the new layout and transition your page. Prepare a cover image as well as update any business info, if necessary, to put your best foot forward. Remember, all pages will transition automatically on March 30, 2012, so don't procrastinate. Review your online marketing strategy. Set some time aside to really evaluate how you're doing with your online presence. Start by doing a Google search of your business. Do you come up in the first or second page of results? If you are, is it because of your website that you own or a secondary social site? If not, how else would potential customers be able to find you? Next, review your appearance and business image online. Do you like the first impresion your business presents online? There's a lot ahead for you to do and think about going forward but all your hard work will pay off!